Vinyl windows are already some of the most energy-efficient windows on the market, and they can save you thousands of dollars in energy costs over their life span. They effectively act like another layer of insulation for your Winnipeg home thanks to their double- and triple-pane construction that is buffered by a pocket of inert air or gas. When the sun is beating down on your home all day, even vinyl windows will start to feel the heat. You can lower the temperature around the windows (and your home) by adding shade. You can do this easily and quickly by adding awnings to your windows. For a long-term solution, you can plant shade trees near your home. They will add shade in the summer, but their leaves will fall and allow in more sun during the winter. Just like you can tint the windows on your car, you can tint the windows on your home. The tinting will deflect some of the sun's rays, cooling down the window (and your home). You can request tinting to be added when you are purchasing replacement windows, or you can add the tinting to your existing windows. Ask a professional to install the tinting to ensure a smooth application and eliminate bubbles and other unsightly errors. Black-out curtains not only make a room cooler, but they also create a more soothing environment for sleep. They keep out the UV rays that can disrupt sleep cycles, giving you a more restorative sleep. Black-out curtains can be purchased in a wide variety of styles and colors. You aren't limited to the heavy curtains that look like tapestries. Even light-looking fabric can be designed as a black-out curtain with the right material. 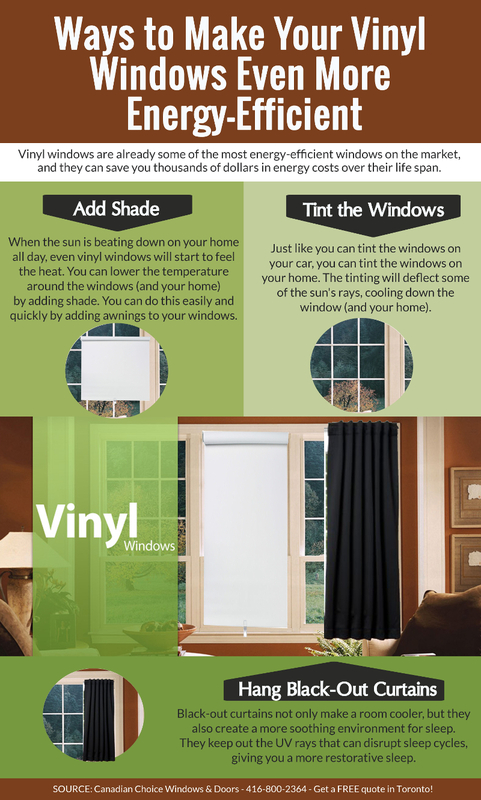 Simply owning vinyl windows is enough to help you save a lot on energy costs over the years, but these tips can help you make your windows even more energy-efficient. If you don't already have vinyl windows, click here to check out vinyl windows deals in Winnipeg. Financing is available to make the investment an affordable one.